Early in Elton John's career -- before the platforms, glitter and far-out frames -- he was a singer/songwriter who recorded several rootsy pop albums with his lyricist partner Bernie Taupin. John and other proto-Americana acts -- The Band, Crosby, Stills, Nash and Young, assorted LA/Laurel Canyon rockers of the early 1970s -- were pursuing an organic fusion of country, R&B, folk and rock, following the lead of the late cowboy iconoclast Gram Parsons. John's contributions to this mix were his fey piano charm and vaudevillian panache. The aesthetic powered three country-pop gems: Tumbleweed Connection and Madman Across the Water, in 1971, and Honky Chateau the following year. Somewhere along the yellow brick road, Elton John lost his countrified chutzpah. He skidded off the range and into the Top 40 radio zone, becoming a household name among the housewife set -- and a gay icon, as he slipped out, in, and then permanently out of the closet. He gained new audiences with a slew of highly contagious pop hits (humming "Crocodile Rock" right now?). The respect of his early fans was sacrificed on the altar of mushy smash-sellers. John's twangy backpages were reclaimed by the roots-rock community in the 1990s. Notably, NC's own Ryan Adams championed the beauty and eclecticism of those early Elton John albums. In return, John was newly inspired by his old works and those younger fans' regard, resulting in 2002's multi-platinum Songs from the West Coast. This pop moment was represented by Anna Friel's Sunset Strip character based on the subject of "Tiny Dancer," and the touring sequence of another cinematic paean to the 70s LA rock milieu, ex-rock critic Cameron Crowe's film Almost Famous, wherein the fictional rock band Stillwater sang along to the same country-tinged classic. In 2004, John released his 43rd album, Peachtree Road, an ode to his adopted hometown of Atlanta. The disc is his best attempt in decades at recapturing the rawness and honesty of his rootsy days. Most of the overtly pop radio tones he's become synonymous with were dropped, the Broadway drama queen undertones eschewed to dig deep for Southern gold. Peachtree Road gained Dame Elton some of the best reviews of his three-decade-plus career. Yet it was a commercial flop because the fans the singer has courted for more than 20 years only want a new "I'm Still Standing" or "I Guess That's Why They Call It the Blues." Still, John, 58, can afford to drop an album that pleases the soul more than the pocketbook, since his pop ubiquity has extended his shelf life. Last summer, he saw some chart action when his hauntingly gorgeous "Indian Sunset" -- originally from Madman -- was used as backdrop on the late 2Pac's "Ghetto Gospel." And John's new collaborator, Ryan Adams, has joined the icon in the studio and onstage. Now even Adams' mainstream polar opposite, Tim McGraw, has jumped on the bandwagon with a recent hit cover of "Tiny Dancer." What's more, Island Records recently reissued the deluxe edition of his 1975 concept album Captain Fantastic and the Brown Dirt Cowboy. Next year, John and Taupin will release a sequel to commemorate the 30th anniversary of its release. In the middle of his longwinded shows, John's been playing the album in its entirety. So get comfortable when the never-ending Peachtree Road Tour comes to the Charlotte Bobcats Arena this Saturday night: Many Peachtree songs pepper the set list, but the pop favorites will not be ignored. John also hasn't abandoned his adult-contemporary and Broadway material completely. He and Taupin recently announced their first stage work together -- Lestat, an adaptation of Anne Rice's Vampire Chronicles, opens in New York City next spring. And just this week, ABC announced it has green-lighted Him and Us, the tale of an over-the-hill rock star loosely based on John's life. Finally, John revisits his disco diva days on the Scissor Sisters' forthcoming sophomore release, since the Dame helped pen nine songs -- his first ever time writing with anyone in the same room. Peachtree Road might not be a permanent detour for John. But it brought his humble twang-centric beginnings back into the mainstream and, more importantly, back into his own musical vision. If you're shelling out the big bucks for this tour, grab some of his early-70s work while you're at it. It's genuinely the stuff that Elton John is made of. 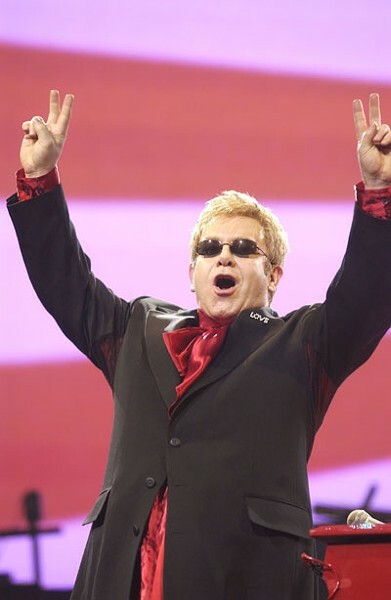 Elton John brings his 2005 Peachtree Tour to the Charlotte Bobcats Arena this Saturday, Nov. 12 at 8:00pm. Tickets are $35.00, $55.00 and $85.00. Call 1-800-495-2295 or visit www.charlottebobcatsarena.com.